Samsung Digital Imaging Company Inc., a market leader and award-winning innovator in consumer electronics, today extended its renowned 2View family of digital cameras with the introduction of two new models, the PL150 and PL100. Offering Samsung’s dual screen LCD technology, the new mega-pixel (PL150-12.2, PL100-12.2) PL150 and PL100 offer a variety of updated features which will make it even easier for consumers to capture their most precious memories with family and friends, both from behind and in front of the camera. 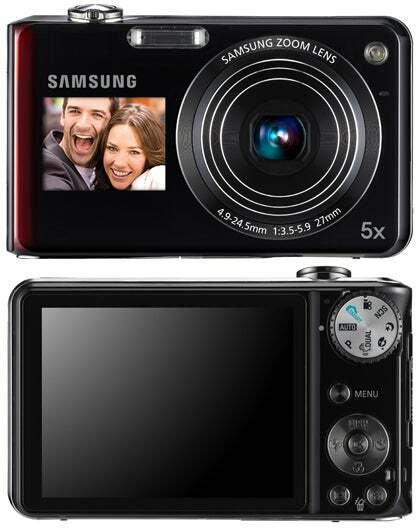 The new Samsung 2View PL150 and PL100 feature a 1.5-inch color LCD screen located on the front of the camera. This 1.5-inch display gives consumers the ability to perfect their self-portraits or join their friends and family in the shot. New for the Samsung 2View PL150 and PL100, consumers can now use the 1.5-inch front LCD to frame video in addition to digital stills. With the PL150, consumers can enjoy 720p HD video recording at 30 frames per second (fps). An optional HDMI adaptor is also available for the PL150, so that consumers can enjoy their HD video, as well as digital still images, on an HDTV or HD monitor. The new 2View cameras also allow users to have more fun with the dual LCD screens thanks to the addition of the Couple Shot feature and the updated children Mode with music. Enhancements have been made to some of Samsung 2View’s most celebrated features on the PL150 and PL100, including updates to the cameras’ children Mode and Self-Timer. In addition to playing a fun animation on the front LCD screen, the PL150’s and PL100’s Child Mode will also play a musical tune to better help capture a child’s attention in order to snap the perfect picture (additional animations are available for download at www.samsung.com). The self timer function of the original 2View cameras perfected the group shot because it displayed a preview of the image and a visual countdown timer in the front LCD screen, giving everyone in front of the camera an indication of exactly when the photo would be taken. Taking the self-timer to a new level, the new PL150 and PL100 now extend that same functionality when recording video, so that the entire group will know exactly when the camera is rolling. When it comes to capturing the perfect shot, the Samsung 2View PL150 and PL100 include the popular Smile Shot feature, which will automatically trigger the cameras to take a photo when a smile is detected, but the addition of Couple Shot allows users to set the camera to snap a picture when the subjects in the frame tilt their heads toward one another. The new Samsung 2View PL150 and PL100 come fully equipped with a true colour-filtered 12.2 mega-pixel CCD, providing sharp and detailed images. Whether taking pictures indoors or out, shooting a landscape or friends around a table, the PL150’s 5x optical zoom, 27mm-wide angle lens gives you a wider shooting range from a shorter distance. The PL150 is also paired with Samsung’s Advanced Dual Image Stabilisation (IS) technology to help consumers capture crystal clear, blur-free images. The PL150’s true Dual IS combines both Optical and Digital Image stabilisers to produce sharp images without the confusion commonly found in other cameras. The Optical IS intelligently compensates for hand trembling by shifting the lens in the opposite direction. When Optical IS isn’t quite enough, the Digital IS automatically takes over to ensure blur-free images. The PL100 features a standard 35mm lens with 3x optical zoom, and is paired with Digital Image Stabilization. Both the PL150 and PL100 feature large, rear LCD screens with resolutions of 230K-pixels. The PL150 features a larger 3.0-inch rear LCD while the PL100 features a 2.7-inch LCD. Both cameras feature Samsung’s advanced scene recognition technology, Smart Auto (Still & Movie of PL150), which has been upgraded for use with video as well as with still images. Designed to simplify the way consumers take a photograph, Smart Auto (Still & Movie) ensures that users never have to worry about their photos being washed out, too dark or out of focus. Smart Auto (Still & Movie) analyses key elements of the composition of the image such as colour, brightness, motion and subject and then selects the appropriate scene mode which will produce the best results possible. Similar to the way the technology analyses the composition of an image when capturing digital stills, the technology will do the same for video, automatically choosing between one of four pre-programmed settings and selecting that which will yield the best footage with proper exposure and colour balance. The PL150 and PL100 also feature Samsung’s Perfect Portrait System – a series of automatic technologies which take the guess work out of shooting beautiful portraits. Key features of this system are Samsung’s Smile Shot, Blink Detection, Red-eye Fix, and Beauty Shot technologies which allow consumers to capture their subjects looking their best. The new Samsung’s 2View PL150 boasts the company’s elegant Touch of Colour (ToC) finish. First introduced in Samsung’s line of flat panel HDTVs in 2008 and brought to digital imaging in 2009 with the SMX-C14 and SMX-C10 camcorders, the ToC design incorporates a hint of colour which is naturally blended into the deep black body of the cameras for an attractive crystalline appearance, making the new PL150 as stylish as it is advanced. The PL150 and PL100 also feature a slanted design, which places the back of the camera at a seven degree angle. This subtle design accent provides users with further options for taking impressive self-portraits and group shots. The issue that many consumers face when taking self-portraits or group shots with traditional digital cameras is the camera must be positioned much higher than the subjects in order to capture the complete image. Thanks to the seven degree angling of the PL150 and PL100, the lenses will always be pointed at the subjects’ faces even if the camera is positioned at a lower angle.